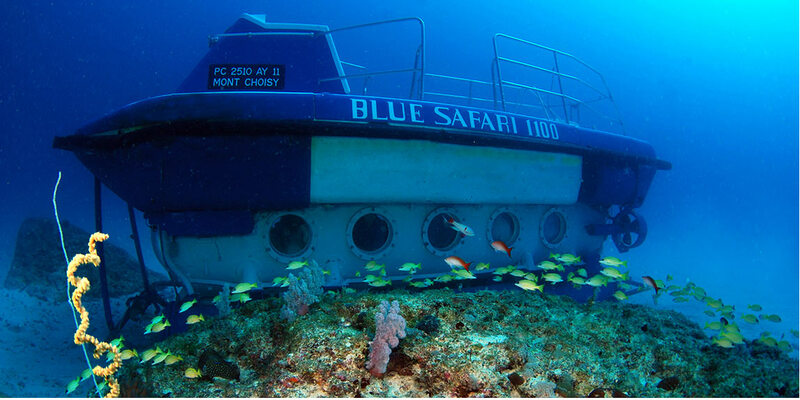 Being a non-swimmer, I have always asked myself if I will be able to discover the wonderous underwater world of Mauritius, that is, until I came across the amazing submarine trip offered by Blue Safari on MauritiusAttractions.com. I just knew I had to seize this golden opportunity. I booked the trip via Mauritius Attractions so that I could benefit from the special, discounted online rate, have immediate confirmation of my booking and know that I have their great customer support to coordinate the submarine booking on my requested time and date. They could even book the transportation to and from the submarine activity location! I just had to go and enjoy my trip. On the day of my trip, I was feeling so apprehensive (I was about to go 35 meters underwater!!). When I arrived at Blue Safari (which is located in the beautiful North-Western part of Mauritius Island), all my apprehensions evaporated against the warm reception of the super friendly staff. They immediately welcomed me and made sure I was comfortable. I was soon, getting ready to experience the underwater world of Mauritius in the safest way possible. We had a briefing before the trip actually started where they explicitly explained to the participants the safety procedures and about the experience we were about to live. Soon after the briefing session, we went aboard a motor boat, which took us to the platform located outside the lagoon. Once aboard the platform, we were transferred to the little submarine by helpful staff and off we went for 50 minutes under the blue sea. The submarine can seat 10 people at a time and each one of us had our personal window so that we had an unobstructed view of the ocean. The experienced pilot ensured that we were comfortable in the air-conditioned submarine and he guided us throughout the trip, explaining everything to us as we went along. It was really helpful, since we were able to distinguish between the different types of fish (such as Zebra Fish, eels etc.) The witty nature of the pilot made the trip even more interesting. We saw several coral formations on the ocean floor which served as home for the fish, the wrecks of an ancient Japanese Ship, and an enormous anchor from the 17th-century. We were so lucky that we even got to see several turtles along with a multitude of colorful fish. We were so lost in viewing the amazing underwater creatures and the coral formations that we did not realize that it was time to end the trip. Once we were back at the platform, we were served a refreshing (and much needed) drink. We received a certificate at the end of the trip, which was signed by the pilot to acknowledge the extraordinary experience we just had (another add-on to the memories we were taking along with us!). As we were on our way back to the shore, I was already planning my next underwater adventure!